Any book on the human brain/mind is sure to light up my... well, figurative antennae. To top it, an award winning book on the evolution of human intelligence, written by a renowned scientist, was simply screeching to be read. Carl Sagan has carefully arranged his thoughts and his speculations on the evolution of the human brain, trying to pin-point the turn when intelligence made its entry and propelled Homosapiens to the the top of the food chain. Not sure if I’m hovering on the brink of a “Writer’s-block”, or some form of lapse in the Broca’s region of my brain, but lately I have been struggling to pull out words from vague puffs of thoughts. I take longer than usual to speak, and wrestle with my mind to put down intelligent (or even sensible) sounding words on paper. So, my thoughts on this book are going to sound quite inadequate. And honestly, I’m quite surprised that I am not practically oozing with things to discuss and reflect on after reading such a book. One of the things I was disappointed with the book was that, Sagan dwells on the evolution of the human brain - the physical mass itself, while I pointedly wanted to read about the progression of intelligence. I guess it goes back to the philosophical implication - there is no mind without the brain. And yes, I understand that it’s not easy to define intelligence without discussing the numerous cognitive regions of the brain. But, since I was quite familiar with the regions of the brain, the localized and non-localized cognitive functions, the extremely cool experiments with people and monkeys concerning language, the mind-blowing experiments with “split-brained” people, the significance of the corpus-callosum and the interaction between the left and right hemispheres etc.... the book didn’t hold enough insights or surprises for me. I was looking for a few missing pieces in my puzzle, and it sadly didn’t hand me those. Nevertheless, it’s an intelligent and engaging read. And for an astrophysicist to gather so much research evidence and glean wonderful and precise insights into the complexities of the human brain is testament to Sagan’s mind-blowing intelligence. Sagan also has an interesting take on the abortion issue. He defines the beginning of human life to the start of neocortical development. For, according to him, that’s what sets us humans apart, and if we are to value human life, the neocortical development seems to be a reasonable cut-off point for him. I don’t really agree. What if one’s neocortex is poorly developed, or gets damaged? Does the person lose their human label, and all the dignities that go with it? Besides, as the book reiterates, intelligence arises from numerous complex cognitive activities, spanning several regions of the brain. The issue of the start of life is far too ambiguous and philosophical still. But I enjoyed reading such extrapolations on the topic, including the future that awaits us, Artificial Intelligence, and the intelligent aliens we might have to encounter at some point. 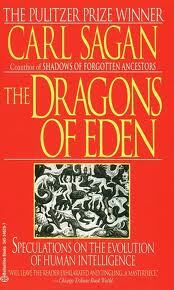 The title of the book might intrigue a few - why dragons, and why Eden? The R-complex of the brain, the deeply buried repressed Unconscious (as Freud might say) harbors our primordial fears, desires and instincts. It’s called the reptilian part of the brain - the one that still instills fear and loathing of reptiles, our early deadly predators. Our brain seems to have evolved to combat the predators - for example, the reason why we sleep at nights and dream of dinosaurs and dragons. So in a convoluted way, our brain’s growth is due to the fear of reptiles (or, by natural selection, the brains that could survive such predators have sustained). It has given rise to various cultural beliefs and myths surrounding reptiles and snakes (such as in India). Even in the genesis, it’s because of a reptile, mankind gets thrown into a world of sins. But we progressed because of our well developing neocortex and seamless interaction between the left and right hemispheres (one pattern matches to form rudimentary hypotheses about the world, and the other critically and rationally weeds out the illogical hypotheses). Sadly, even in this state of evolution, many left hemispheres don’t work as rationally, and myths still abound. Sagan goes on to talk about the importance of rationality in our civilization. And there are many more interesting cultural beliefs that tie with all this. Ever wondered why every human civilization insists on training the right hand? I won’t spoil this for you, if you really are contemplating on reading this book. How wondrous - your brain will seek out to learn more about itself.